You are here: Home > HTC Bresson A 16 Megapixel Windows Phone 7 Device? I couldn’t help but notice in the midst of typing up yesterdays roadmap post that Windows Phone 7 devices were notably absent. While a WP7 device hasn’t been announced in some time I had every belief that a new set of devices would come to T-Mobile before the end of the year. 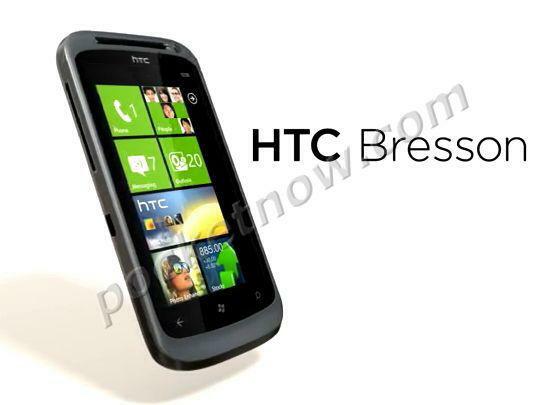 As it turns out there WAS a Windows Phone 7 device on the roadmap, the HTC Bresson. Our friends at Pocketnow are claiming that the Bresson is a 16 megapixel Windows Phone 7 device. We should note that the above picture is more likely a placeholder for the HTC Bresson as the image appears to be a modified Desire S. The Bresson is scheduled to hit sometime “beyond” September 2011 making it a likely candidate for the Windows Phone 7.5 Mango release. The name Bresson is likely taken from the French Photographer which might be reference to the significant number of megapixels this phone will launch with. Check out the teaser video below for an upcoming HTC device with 16 megapixels. I whole-heartedly agree……What I really want is for T-Mobile to get a Samsung WP7 device. Samsung’s camera sensors are top-notch, as are they their AMOLED screens. But their voice quality is terrible. Guess my hunch was right, I was just saying to myself earlier that this sounds like a windows phone. I wonder if it will be hspa+ capable by that time. This is what I need. I miss my windows phone, Android just isn’t doing it for me. Bring me a 4g htc windows phone now!!!!! I’d much rather have a super high quality 5MP camera than a 16MP one. That is of course unless the QUALITY of this cam is obviously superior. Don’t like WP7 much. I wonder what the current HD7 sales are like for T-Mobile. I don’t see many HD7 devices around. Stop that nonsense!!! you cant even install Andriod on a wp7 device yet! Need new windows phones. How about dual core processors. Higher megapixels don’t mean much if the lens can’t resolve the picture for it. HD7 camera is just average. I hope this is a top notch phone. Windows phones are already smooth and fluid as is, what will be the point of a dual-core? The only person I know or seen with a wp7 is my niece. I take train and I haven’t seen one person holding a window phone. They’re just not interesting. I played with one and got bored of it already. Maybe its target to business enterprise folks. Windows Phone 7 = BLAH! All the hardware… With all the potential in the world. Yet the OS kills its chances. SMH! or Blackberry(someone is always asking me do i BBM) or Android. But at work most of the girls have either Windows phone(HTC HD7 or Samsung Focus) and Android phones. * Says she doesn’t pay attention to what phones other people use. * Describes what phones she sees other people use. * Posts on Tmonews like he posts on Reddit. Say what you will about windows mobile phones. The new features in Mango show that they have REALLY thought about the user experience. The interface is intuitive and seems very easy to use. The Mango update sounds incredible. I am switching to Windows Phone as soon as the update comes out. I’ll be getting a new Windows Phone but it wont be an HTC or a carrier branded phone. Unlocked Nokia with good camera components for me! That would be a whole bunch of pixels. Too bad that Windows Phone 7 devices won’t let users send video anywhere unless you sync it to your computer. I wonder if photos will suffer the same fate with this large a size. I was not aware of the lack of video sharing in WP7. That’s a fairly large disadvantage. How long are manufacturers going to bother with WP7 after Microsoft buys Nokia? If you’re talking about Eldar’s rumour of last week, that rumour was swiftly debunked by Nokia. Wonder if HTC is getting it’s windows phone camera credentials in ahead of Nokia though, in case noki stick the N8 camera module in any of their early Windows Phone devices. All merger rumors are debunked till they happen. T-Mobile and Sprint were talking for a whole year and they bother denied that till AT&T swooped in. Thanks for the news. We need more of these WP7 high quality phones on the market.